It's only been one day, but Canada has already garnered its first "fossil" award. The award, which is given to countries who are blocking progress at the United Nations climate summit, is awarded daily by a coalition of 400 international NGOs. According to organizers, Canada was awarded a Fossil of the Day for its commitment to stand on its targets and not to negotiate them throughout the conference. 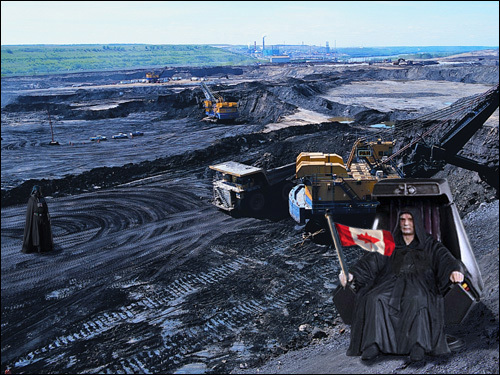 I'm sure Emperor Harper is still beaming with pride today, as all the rest of the Tories punch the air and rave about how they're not going to get suckered into helping save the environment because damnit that costs $ and we should be able to trash our own backyard if we want to, leave shamelessly heavy carbon footprints, exhaust natural resources etc. And who cares about polar bears, seals and other species anyway, they don't even pay taxes! Yes, indeed we should be so very proud that our country, unlike more rational nations which would like the planet to continue housing us for a few more years, just doesn't give a sweet damn about anyone or anything except money (which will be used to construct Emperor Harper's future Death Star).